Apple plans to introduce a new version of the iPhone in July that comes equipped with support for faster 3G networks. And the new version of the popular smartphone will be available for a dramatically lower price. AT&T and Apple have also discontinued their revenue sharing agreement, which provided Apple with a cut of the monthly subscription fee paid by customers. And it appears that part of the reason behind the iPhone 3G’s substantially lower price tag is that the wireless carrier is subsidizing a portion of the handset’s cost—a common occurrence with other phones, but not the case with the original iPhone. The iPhone 3G ships July 11. In addition to the U.S., the new phone will be available initially in 21 other countries: Australia, Austria, Belgium, Canada, Denmark, Finland, France, Germany, Hong Kong, Ireland, Italy, Japan, Mexico, Netherlands, New Zealand, Norway, Portugal, Spain, Sweden, Switzerland, and the U.K. Apple expects the phone to be available in more than 70 countries later this year. When the new iPhone arrives, it will offer support for 3G networking, which Apple says will be twice as fast as the first-generation phone. The original iPhone shipped with support for Wi-Fi and AT&T’s EDGE network. While more ubiquitous at the time than the faster 3G, the EDGE cellular data standard tended to perform slowly. That fact was certainly demonstrated during Monday’s keynote. In an on-stage demo, Jobs was able to download an e-mail attachment in five seconds while the same download took 18 seconds on the EDGE network. A web page loaded in 21 seconds on 3G versus 59 seconds on EDGE. The iPhone 3G offers quad-band GSM and tri-band HSDPA for voice and data connectivity. It will continue to support Wi-Fi and EDGE in addition to 3G. That last point is critical to users concerned about battery life. iPhone 3G owners will be able to switch between 3G and 2G in case they wish to save battery life. However, Jobs boasted that the revamped iPhone improves battery life. 2G talk time has jumped to 10 hours from 8 hours; for 3G talk time, the phone will have a battery life of 5 hours. The 3G iPhone features 300 hours standby time. Highlighting the other features trumpeted by Jobs Monday is the addition of GPS technology. Hardware changes to the phone will allow users to do real-time mapping. Currently, iPhone users rely on data from cell towers and Wi-Fi to find their location on the phone’s Map application. According to Apple’s Web site, the GPS capabilities will also allow for geotagging photos—embedding the location where taken in a photo’s metadata. When it ships the iPhone 3G will include the updated iPhone 2.0 software, which is slated for an early July release. That means the new iPhones will have support for Microsoft Exchange ActiveSync as well as remote wipe and Cisco IPsec VPN for encrypted access to corporate networks. The iPhone 3G also includes the soon-to-launch App Store, which will feature native iPhone applications, and support for the relaunched MobileMe Internet service. The iPhone 3G is thinner at the edges than the original model, though at 4.5-by-2.4-by-0.48 inches, it’s slightly deeper than the current iPhone’s 4.5-by-2.4.-by-0.46-inch dimensions. 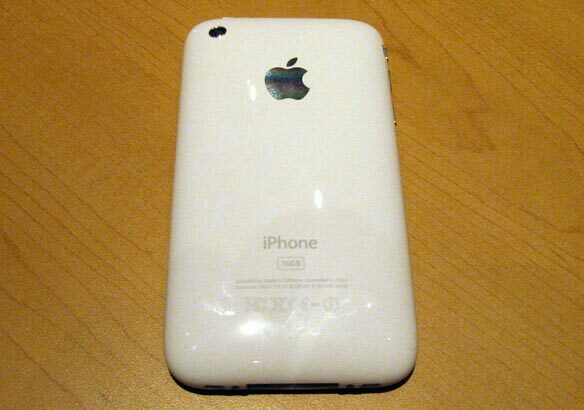 The iPhone 3G is a tenth-of-an-ounce lighter at 4.7 ounces. More important, the new iPhone features a flush headphone jack instead of the recessed headphone jack that the original sports. That saves users the hassle of having to buy an adapter to use with their third-party headphones. The 16GB model comes in white or black. The 8GB iPhone 3G is available in black only. Jobs said Monday that Apple has sold 6 million iPhones since the June 2007 launch. It’s “one of the most amazing products I’ve ever had the privilege to be associated with,” he said at the conclusion of Monday’s keynote. Macworld.com executive editor Philip Michaels contributed to this report. Updated at 2:05 p.m. PT with new information throughout the story. Updated at 3:45 p.m. PT to include more pricing information. Updated at 4:15 p.m. PT to include information about geotagging photos.